The global cartilage degeneration market is characterized by high competitiveness between the leading players such as DePuy Synthes, Stryker Corporation, Zimmer Biomet, Smith & Nephew plc, and B. Braun Melsungen AG. Players within the market are striving for Innovative product development by investing in research and development. Players within the market are also eying economies, with a view to tap onto the unmet medical needs of the people in these economies. According to Transparency Market Research (TMR), the global cartilage degeneration market will be worth US$14.7 bn by 2025. The market for cartilage degeneration market is expected to showcase a CAGR of 5.6% which is quite healthy, between 2017 and 2025. On the basis of region, it is anticipated that North America will continue to lead in the market on account of the growing incidences of sport injuries. A staggering increase in the number of obese people on account of high consumption of junk food and lack of physical exercise will also fuel the growth of the market in North America. 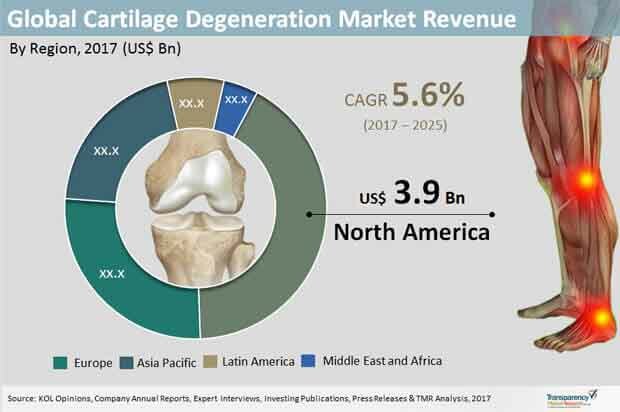 In the years to come, Europe and Asia Pacific are also expected to generate higher revenues for the cartilage degeneration market. According to the World Health Organization (WHO), an increasing number of people who suffer from obesity since last few decades and further, as per a survey by the National Health And Nutrition Examination, obese women are more likely to develop knee osteoarthritis as compared to non obese women. Moreover, obese men are at a higher risk to acquire knee osteoarthritis then non obese men. Therefore, it can be correctly said that the demand for cartilage degeneration will be high on account of the rising prevalence of obesity among women and men both across the globe. The growing busy lifestyle is rendering people to resort to unhealthy and fast or junk food, which is the root cause of obesity and various other diseases. In addition to this, lack of physical activity and sedentary lifestyle will also help drive obesity and subsequently the cartilage degeneration market stands to benefit. Another important factor which is pushing the demand for cartilage degeneration is the rising incidences of industrial mishaps. Sport injuries and road accidents are other factors resulting in the demand for cartilage degeneration. Technological advancements and the introduction of innovative surgery techniques, and innovative synthetic materials are also helping the market to grow. According to the Centers for Disease Control and prevention, 67 million people in the US who are above 18 years will be diagnosed with arthritis by 2013 and since arthritis is one of the leading causes of disability, there is often a need for joint surgery or reconstructive bone surgery. This is expected to create a heightened demand for cartilage degeneration. The growing geriatric population will also help them. Hematite arthritis is also a growing concern among people and the prevalence of this disease will also bode well for the growth of the market for cartilage degeneration.